Fun runs, a Flores de Mayo, parenting seminars and back-to-school sales are all happening this weekend! 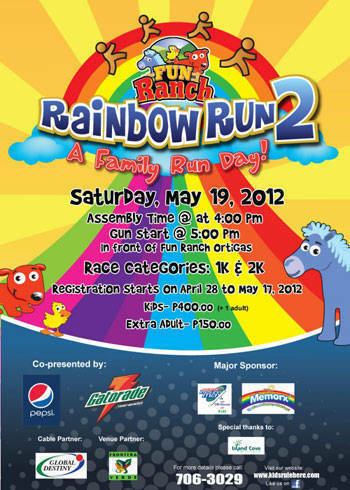 Bring out those running shoes and register now for the Fun Ranch Rainbow Run 2 on Saturday, May 19 at the Fun Ranch Frontera Verde Complex, Ortigas! Be in costume or any wacky, fun attire you can think of to get a chance to win prizes. Special awards also await the oldest runner and family with the most number of registered members. Registration is only up to May 17. You may register online here. For more details, call 706-3029/31 or visit www.kidsrulehere.com or their Facebook page. 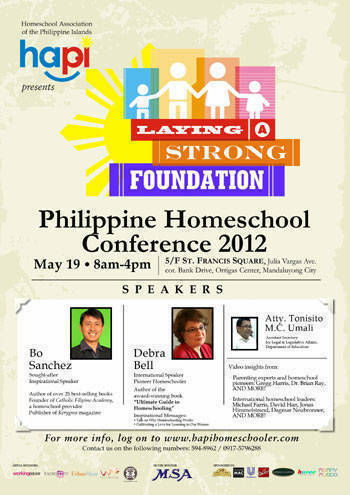 Attend the 4th installment of the Philippine Homeschool Conference 2012 on Saturday, May 19, at the 5th Floor of St. Francis Square, Ortigas Center with this year’s theme, “Laying a strong foundation”. Well-renowned speakers and book authors Debra Bell and Bo Sanchez will be gracing the event. Registration fee is at P800 per person. To register, click here or visit hapihomeschooler.com.